This was kind of the beginning of the end, so to speak. 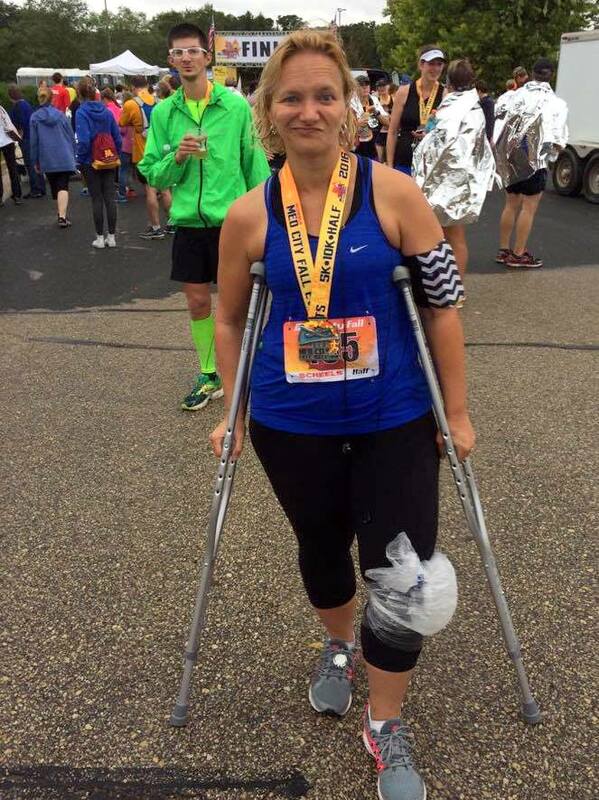 A year ago today my knee decided to show me who was in control of my upcoming race schedule; unfortunately, it wasn’t me. 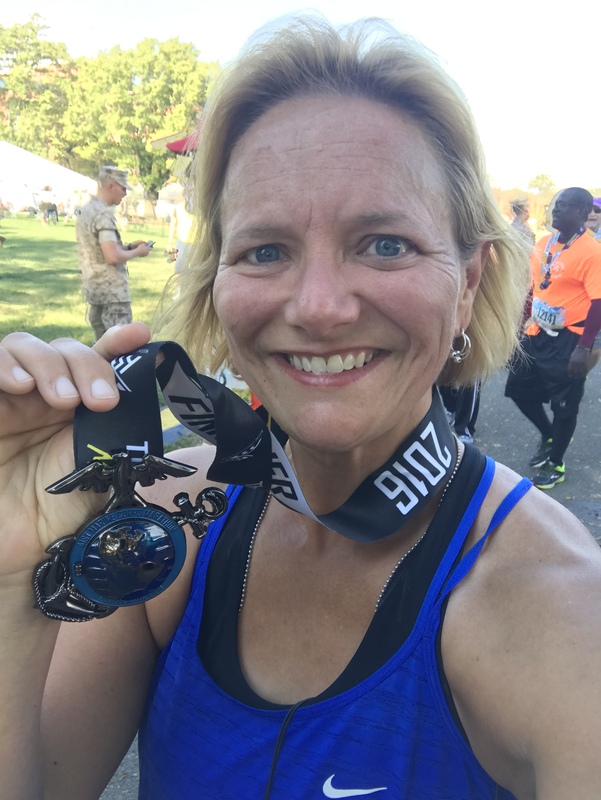 I did some physical therapy, consulted sports med, got a juicy dose of cortisone injected all in aim to put me at the start line of last year’s Marine Corps Marathon in October. Somehow I crossed the finish line that day too, but it was the end of far more than that race. I’m not a great patient, nor am I patient, so the rest of the story is my own darn fault. My next option for treatment was a round of more injections, but that didn’t appeal to me at all, so I limped my own direction. 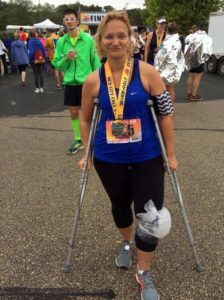 I was dealing with pain from a combination of a mad meniscus, patellofemoral pain syndrome (runner’s knee) and a raging mad case of osteoarthritis. My running came to a screeching halt. I was frustrated but did what I could to keep moving. I’ve continued to strength train the best I can. What I did enjoy about being slowed down was catching up with friends. Those who were intimidated by running have joined me for walks. Others have shown up on the mat next to me for some restorative yoga. 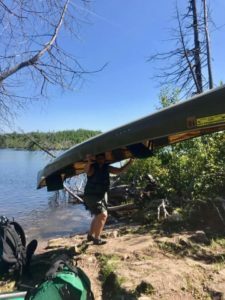 I was able to keep the swelling in check by frequent icing and modifying my activities, but no matter how easy I’d been taking it, I couldn’t get relief from the pain. I worked turmeric and glucosamine chondrointin supplements into my diet, but they never seemed to make much of a difference. I continued to hobble around until July when I schlepped myself to Blogfest at IDEA World Convention…all things Fitness and Nutrition in Vegas. All those workouts and walking, boy was my knee angry! 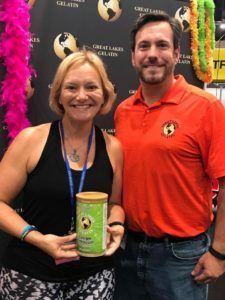 I looked at a lot of products designed to ease my discomfort, but when I literally stumbled upon the fine folks of Great Lakes Gelatin and read about their Collagen Hydrolysate, I was intrigued. But when they generously put the product in my hand and encouraged me to give it a try, of course I had to! What did I have to lose but pain and inflammation! They told me to give it a month to 45 days to notice a difference. I was grateful, but skeptical…why would this be different from what I’ve tried? I started mixing the powder into my morning coffee at the end of July and within a week’s time I already noticed a marked reduction in pain and increased mobility. As the days went on, I no longer needed to ice my knee because the inflammation was gone! 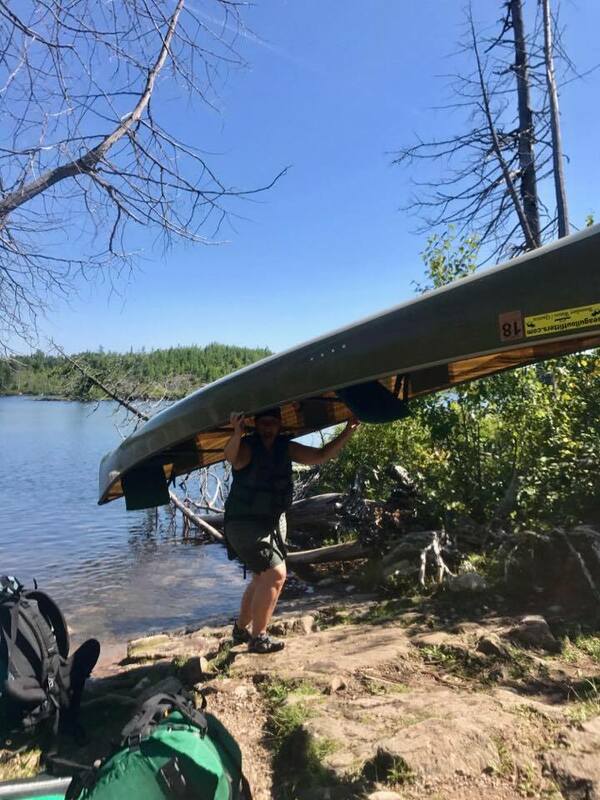 I continued to take the gelatin and in August I was traipsing around the Boundary Waters with a canoe on my shoulders! Although my knee got kind of cranky from this epic trek, the inflammation never came back! A few days of rest following that trip and it was feeling fine again. I felt foolish at the beginning of this month when I looked closer at the can and realized I could have been taking it TWICE a day, so I’ve started doing that to experience its full effect. Friends, I must admit I am not cured. I still experience some stiffness and discomfort when the clouds and thunderstorms roll through, but NOTHING like it was. I’m back doing almost everything in the gym because not only does it not hurt, the tightness and thickness that previously grounded me has diminished! I plan to continue using this product because I am astounded by the difference it has made! I should tell you too, that I’ve noticed some bonus benefits of a great complexion and stronger nails and hair. And for a lady in my mid-40’s…I’ll take all the help I can get! If you’ve been struggling with age or sports-related collagen loss/cartilage damage or joint/pain discomfort, consult your physician. But also keep Great Lakes Gelatin in mind for what your doctor-recommended pain relievers can’t help! I whole-heartedly give this stuff the FIT BFFs stamp of approval! This entry was posted in Exercise, Product Reviews and tagged cartilage damage, collagen hydrolysate, collegen loss, Great Lakes Gelatin, increased athletic performance, increased mobility, inflammation, joint discomfort, joint pain, knee injury, knee pain, osteoarthritis, pain relief, patellofemoral pain syndrome, product review, runner's knee. Bookmark the permalink. That was surely the most stressful part of your life. I am glad that you managed the things quite well and overcome the bad phase. Sapana, it was definitely an inconvenient pain, but nothing compared to the agony of watching a loved one struggle or lose their fight…perspective.